With the legacy of war still fresh on the streets of Bosnia and Herzegovina, this Balkan gem is often overlooked as a holiday destination. Part of the former Yugoslavia, Bosnia and Herzegovina endured a bloody and destructive war for independence in the 1990s, which ripped apart its capital and other important cities. Since then, Bosnians have moved on, and as the rest of the world does too, tourism in the country is slowly growing. You’ll be welcomed by locals with open arms, eager to share their country and culture with those who include Bosnia and Herzegovina in their itineraries. 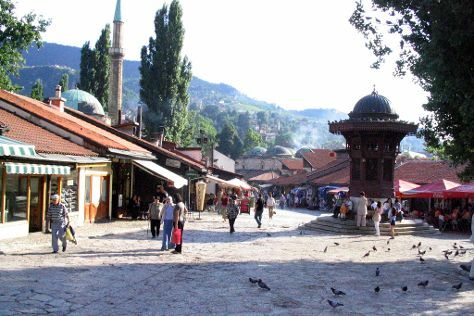 Sarajevo and Mostar top most visitors' list of places to visit for their rich history and charming streets. Make sure to indulge in some local specialities such as burek. Bosnia and Herzegovina is in Europe. Take a look at our Bosnia and Herzegovina trip planner to refine the details of your trip to Bosnia and Herzegovina.